Sometimes I begin things and they don’t lead anywhere – sadly, the Big Rook sculpture is one of those projects. I’ll drop some photos of the project behind a cut tag. Ravens and crows are my favourite birds – intelligent, clever and that lovely glossy black attitude. Here’s my first little sculpture. The original (oil based clay) is still sitting around somewhere and I’ve been casting this in a variety of materials. I’ll be making these and posting them on Etsy. 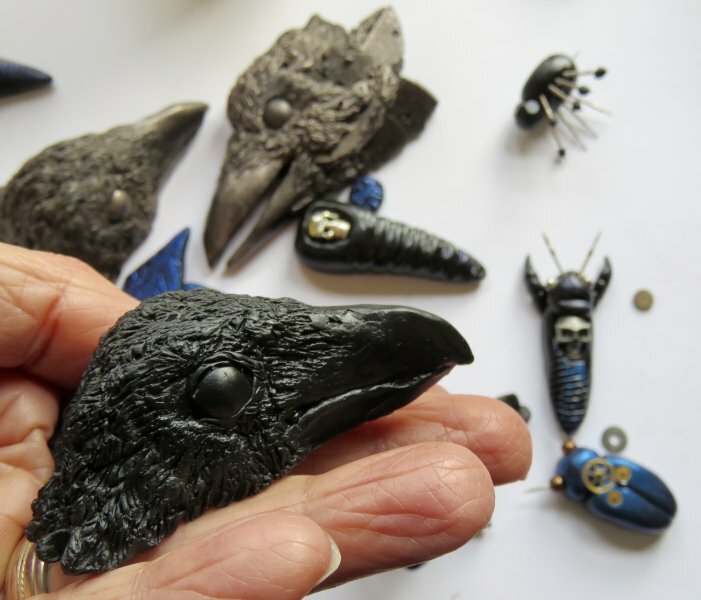 So far I’ve done 3 sculptures – the one in my hand in the photo and the one behind it with the clockwork in the design – and the one I’ve yet to finish, Big Rook. I really wish my dad was around to discuss mould-creation with me. sigh. A new cast from the Small Raven Head mould I made about a year ago. 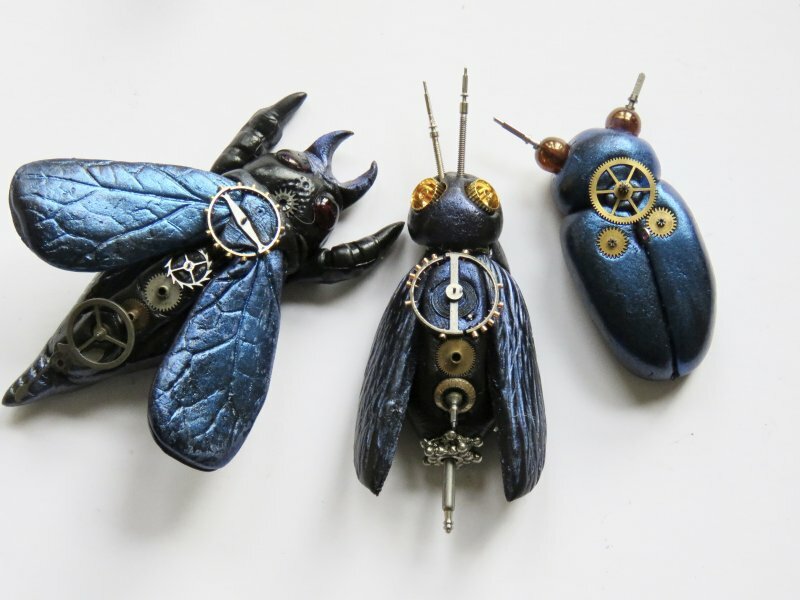 Read and see some photos of The Big Raven sculpture ..
Well, there is still work to be done on these little Death’s Head Moths. I always find more work to be done after I’ve taken a few photos. 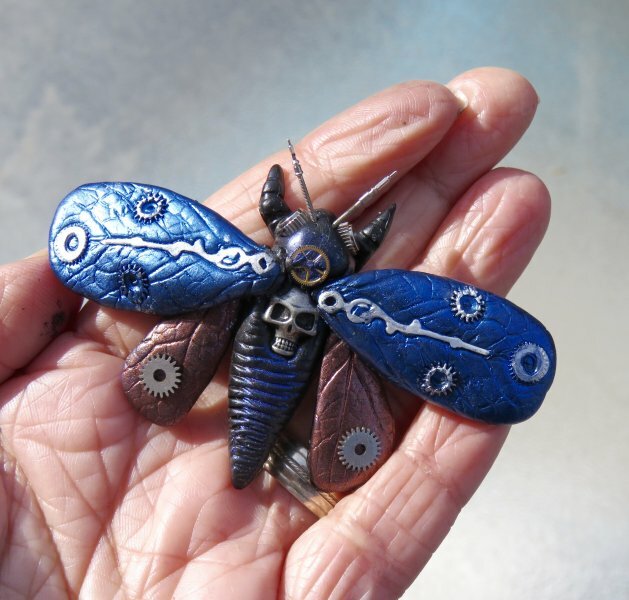 The slightly larger moth needs some paint touch up and a coat of some kind of varnish to make certain those wrist watch gears don’t pop off. sigh. 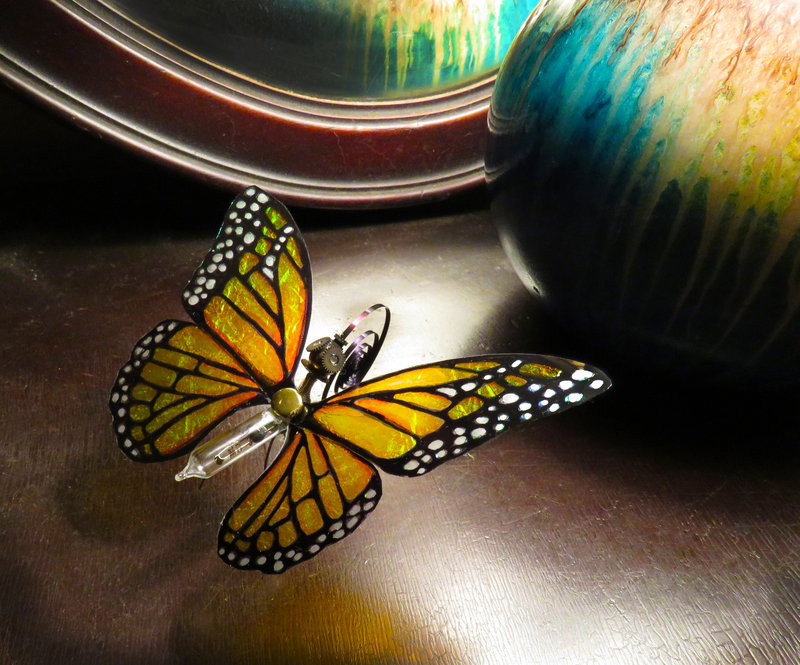 I’m not really using glue on these creations – but epoxy. Epoxy tends to be stronger. I built some wings in clay and then made a mould. These two moths show off the 3 wing designs I made last week. The colours are brilliant. 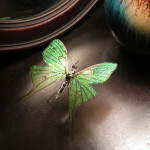 I’m using metallic powders and working them into the epoxy which makes them shinier and more durable. More images will follow as the works get completed – and they will be listed on Etsy as I get back into the swing it all. 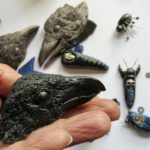 I’ve begun to cast some of the ravens and “heads” in the new epoxy clay but there tends to be a lot of “misses” – or gaps in the casting because the clay is sticky and dense. I am though extremely happy with the weight and texture as they don’t feel like epoxy. It has been many months since I’ve had the chance to do new work – but spring is here and finally I’m able to restart some projects. I’ve been doing some Apoxy-clay experiments combining them with a variety of powdered metals. It takes quite a bit of the powder to give it the shine, and a kind of buffing as it starts to harden too. I’m really pleased. 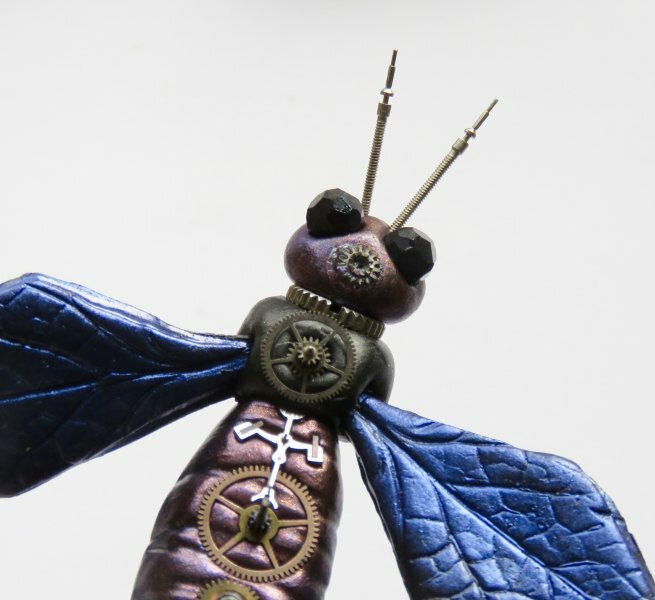 The new insect and arachnid sculptures are a real mix of materials. 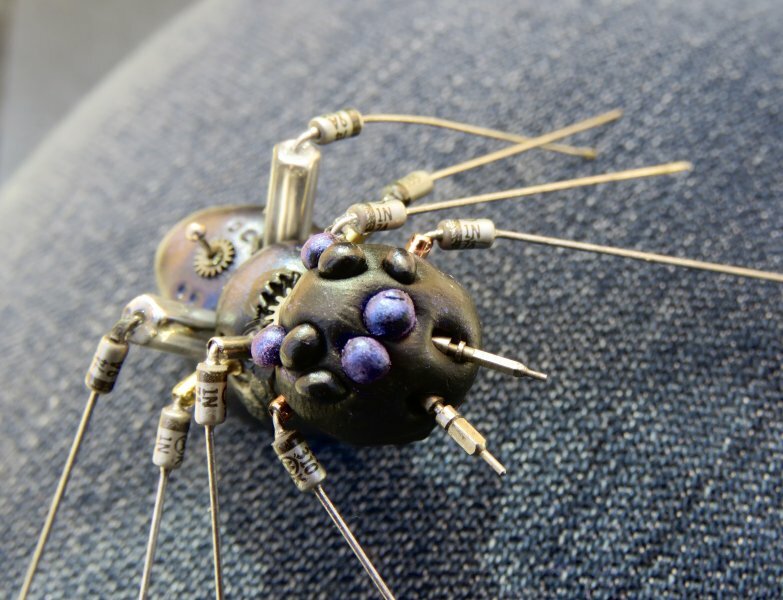 Epoxy, Apoxy Clay, watch parts, diodes and capacitors, beads, metals, glass – all of it merging together like some runaway Terminator. 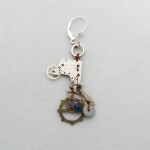 In fact, I had started a Terminator series of bone and wire work a few years back. 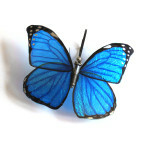 I think it is time to revisit some of those ideas incorporating the epoxy into the mix. 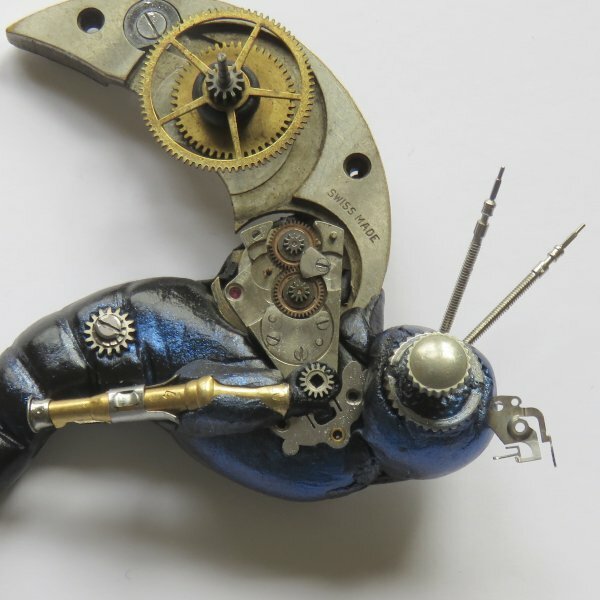 The epoxy is the flesh while the clockwork parts, gears and electronics are the decorations. I’ve talked a lot about sculpture – and most of the work I’ve done has been more along the lines of constructing sculptural pieces. Found objects, old treasures, vintage electronics all coming together to for an sculptural object. Robots! Desk sculpture! etc. 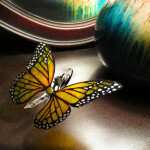 This winter I took up casting epoxy jewelry, which was fun. 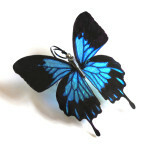 I was looking for some way to make Glow-in-the-dark jewelry. Which was also fun! Fun all around, but I quickly realized I wanted to make some molds. 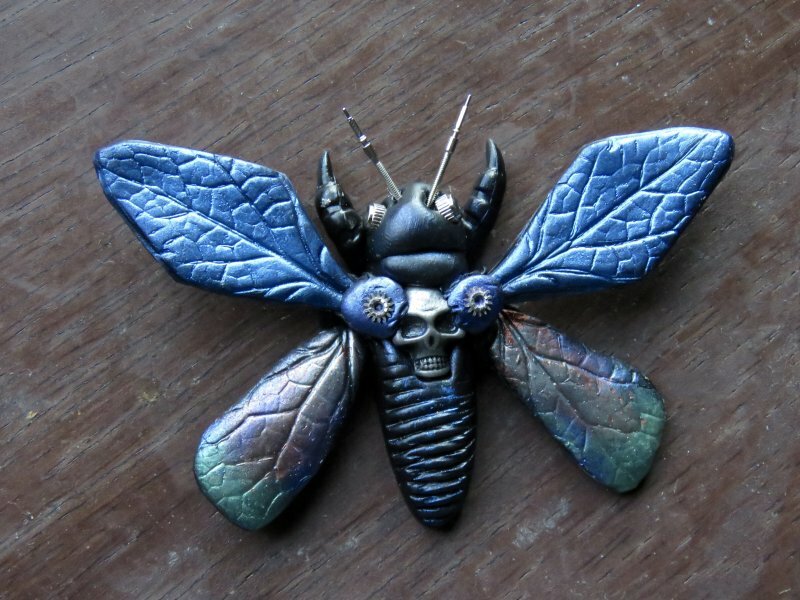 Or at least make molds and then cast some unusual jewelry parts. That meant finding a good mold making material. I bought some EasyMold Silicone Putty. Not bad – very easy to use – quick. Unfortunately I noticed it often had gaps – likely the way I used it. The putty would also sometimes get pressed too hard (causing the items to slide around? 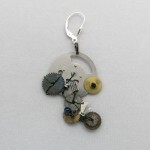 and become out of shape) – or pressed around the item too lightly – and not pick up detail in the gears. EasyMold review: 6/10 – not bad but not right for me. Next up: a reuseable mold making material: ComposiMold. Wow, this stuff seemed perfect. I imagined so many ways to build and reuse a mold. My head exploded. It came (alas) with almost no instructions. It should have come with a BIG note say: heat this slowly or you will get bubbles. Many bubbles. And you won’t be able to get them out. I never ended up casting anything because I could never really get it clear enough. I made 3 or 4 molds, but looking at the surface I could see little bubbles on the surfaces. This would not create good edges etc. All I could imagine was creating something that would have so many microbubbles that I would immediately toss out the items. It is probably GREAT for … small casts of something. Candy! Chocolate… I dunno. Something not what I am doing. But – they are awesome at answering Facebook questions. Very nice. Quite helpful. Too bad I’d used 70% of the material to create a bubble-filled pile of composimold. One day I might try that 30% that I’d not heated yet. I’ll microwave it VERY SLOWLY. soooo slow. maybe that will help. I went to a sculpture supply store in Etobicoke. It was around the corner from a factory I worked at in 1980s. I went with my Dad who knows everything about almost everything, including molds and casting. On the first trip I picked up material that would need to be vacuumed… and gee. Did not yet use it… because Degassing is a Pain in the arse. Very importantly though, I bought some modeling clay – which has changed my life. More on that later. On trip #2 I talked to the staff who suggested Smooth-On Silicone Rubber – easy to mix (1 to 1 ratio), no degassing needed (aka vacuuming), pour and quick demold (6hrs). Smooth-on was exactly what I needed. EXACTLY. It makes great molds, good detail, doesn’t seem to be full of bubbles and keeps great texture. There’s a bunch of YouTube vids about using it… and they are pretty accurate. I would only suggest: if you can use it outdoors, or in a super vented area – do so. Wear proper gloves. Pour slowly. Well, I’ve expanded The Robot Army in the past few weeks. 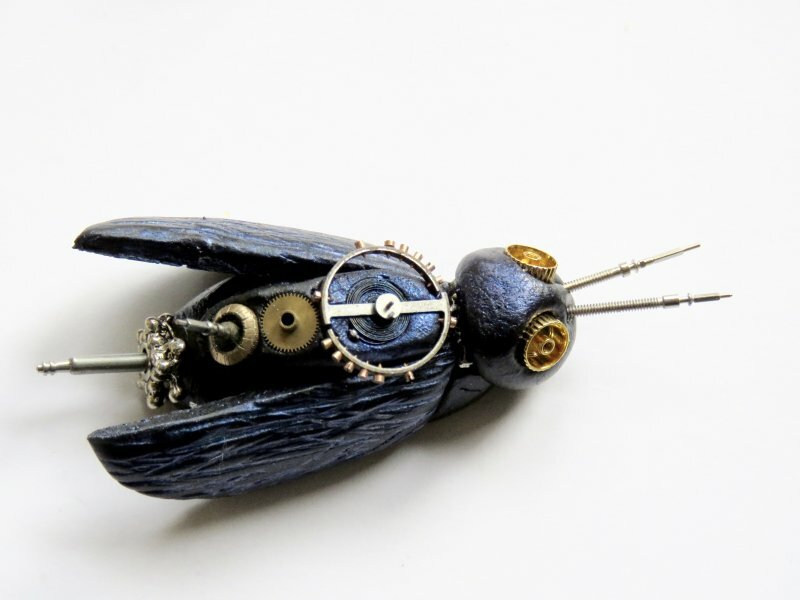 I’ve always made insect sculptures and included insects in my jewelry too. When I was approached for the Active Surplus Art Show I decided to create a few new pieces. 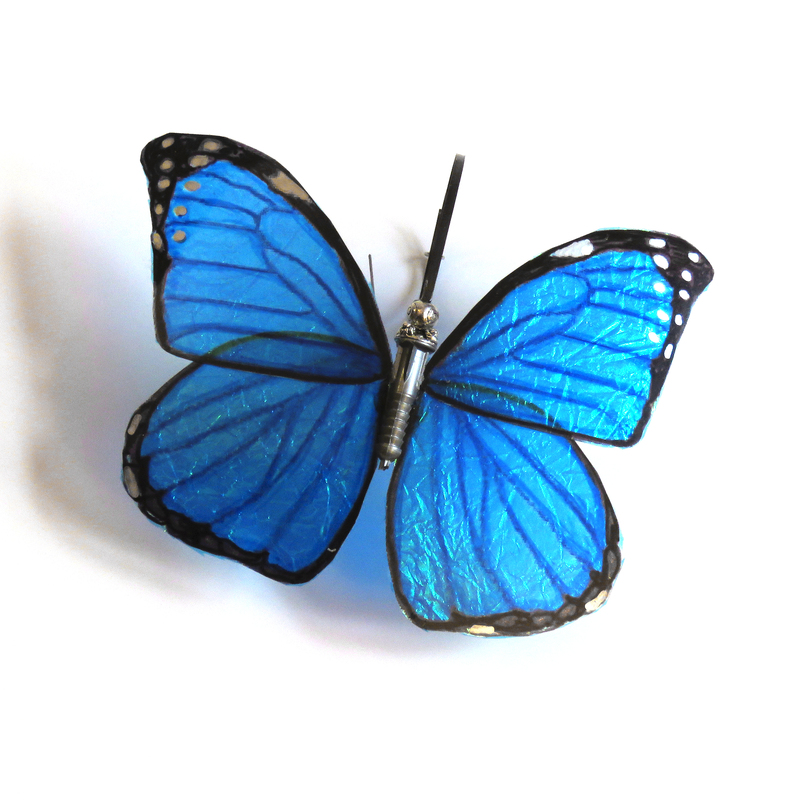 I wanted to give the older butterflies some new wings. I had a bunch of paper kicking around, and had been close to tossing some out. 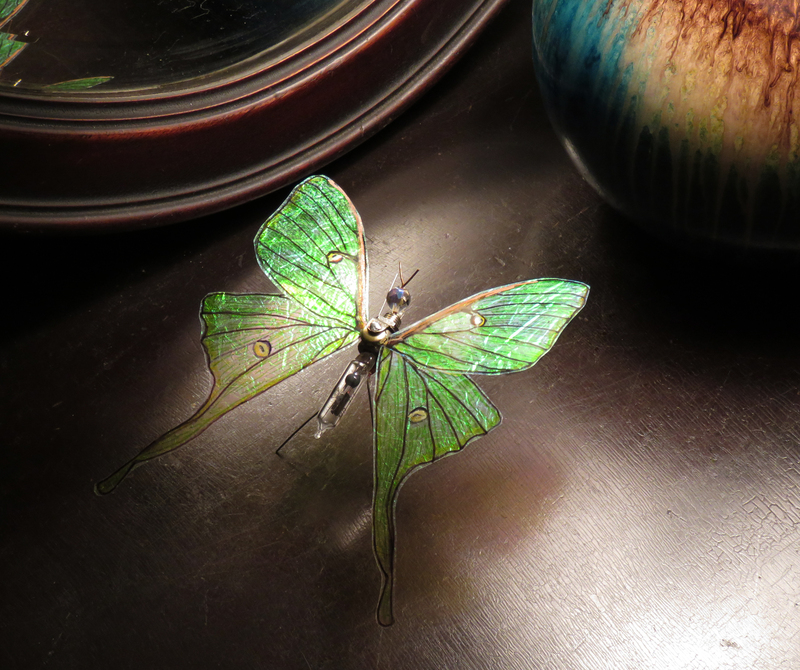 Then I decided to paint the wings… on plastic. They came out okay, but I really wanted something outstanding. The first few experiments involved some old plastic ribbon I had – and the ideas started rolling in from there. 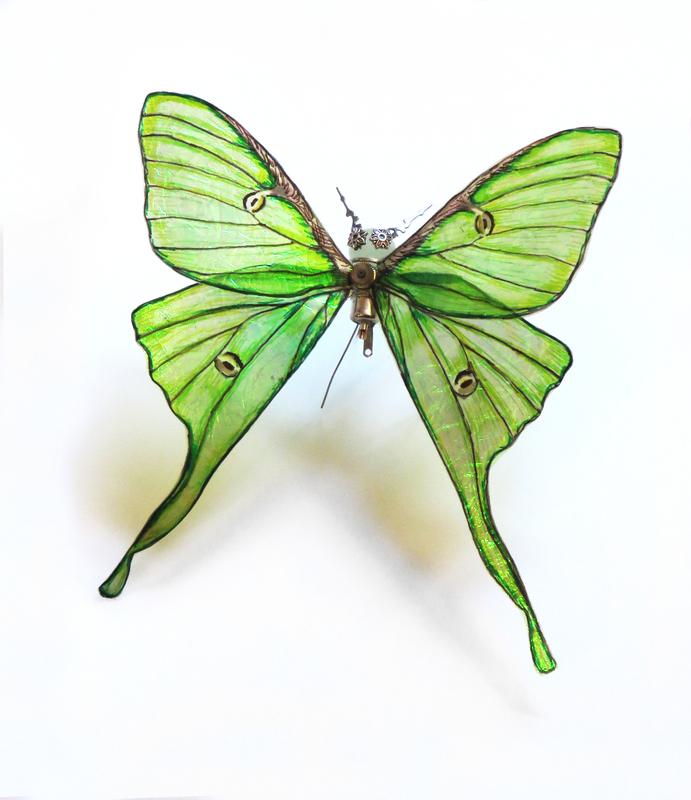 After several tries I now draw the wing pattern based on photos and spend time coloring each layer. 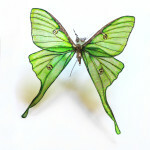 Most of the wings are 2 or 3 layers of plastic, old Japanese paper (that I bought in 1992 or so), and whatever I can find. So far, I’m pretty pleased. 10 days until this year’s Hallowe’en craft show: the Bazaar of the Bizarre. Of all the shows here in Toronto, the BotB has to be one of my favorites of all time. Although it is a “Halloween show” – this is the season when every one is thinking about Christmas gifts. Expect Crowds. What makes the Bazaar really outstanding are of course the merchants. It is full of the strange and unusual. The kind of place where all the alternative crafters come to meet. I usually buy a few special things whenever I get the chance to flee my table. For the first time I’m working on a more elaborate display with signage. This should be a great show. 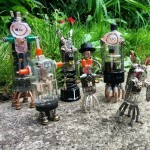 The Robots are gathering – and now I’ve got some lovely vacuum tube space ships and a few ray guns as well. Glow-in-the-dark Bots! Glow in the dark robots… I think they look like alien robots. I’m really happy with the glowy-head guys in The Robot Army. I’ve got a few created – at least 3 or 4! There’s just something awesome about things that glow in the dark. 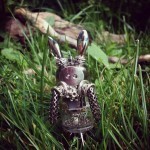 Robot Bunny! The Bunny Bots have arrived…. 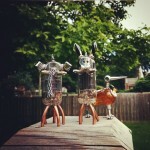 Bunny Bot and friends… taking a trip to the great outdoors. Elephant Robot, Bunny Bot and background: Tripod Duck. Robot Bunnies? Why, yes, of course we’ve got Bunny Bots. They form a special division in The Robot Army. Their secret weapon is cuteness. When I found some very old glass bits, I thought: hmm… Bunny ears! oh those rabbits…. and a new division of Robotic cuteness was born. “Cycles of Heaven” is based on the orbit of distant stars. 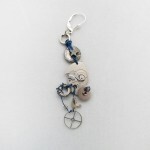 This single earring is part of a new series. 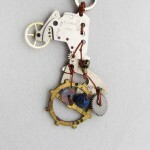 The sweeping arch of steel comes from a pocket watch. 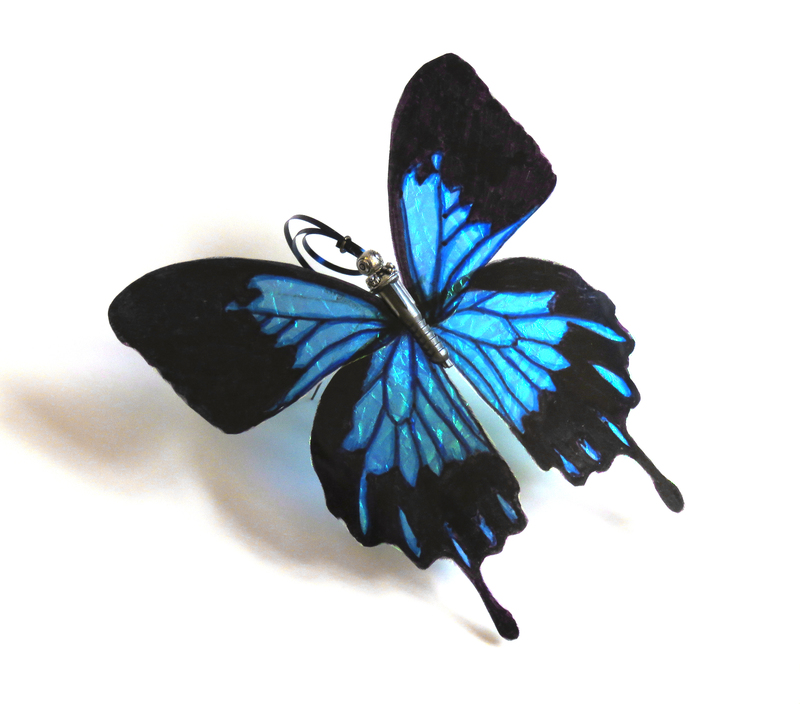 a single earring with lots of “negative space”. A small hematite star adds a bit of depth to this very silver single earring. fine detail and a larger brass gear. A small bead of lapis as well. details of this unique, single earring. So, I’ve been either working on the robots or preparing for the recent Steam On Queen show – which was a smashing success. So many of the robots vanished – over 70%. Which was a bit insane. 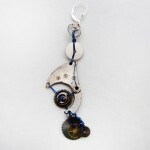 Now the madness is done, I’m just going to post up a bit of new work – some earrings I’ve designed. 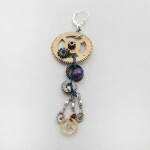 Because they use the smallest gears – and some thin, thin pieces – I’ve wired them together. 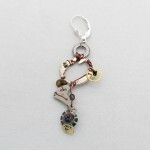 This allows me to use pieces that are otherwise too small / too thin to use anywhere else.